Last month we spent a week in Riga, Latvia, exploring the city and all the great sights it has on offer. While in the city many events were going on, snot the least the Riga 2014 European Capital of Culture, including the Riga Photo Month and the street art festival Blank Canvas. 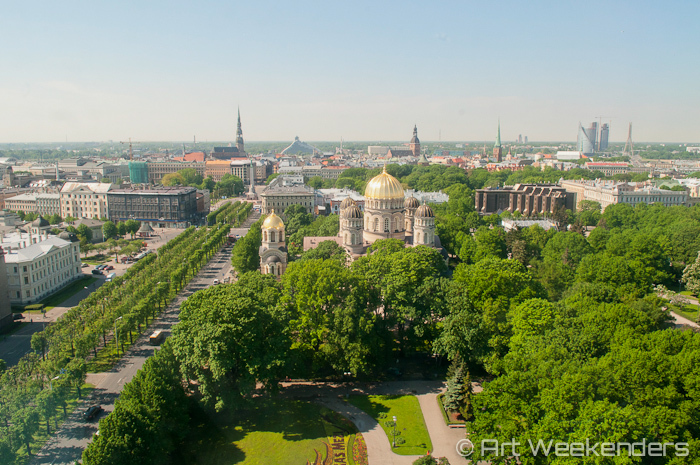 Keeping in mind that Riga already is the city where you can admire the stunning Art Nouveau structures and the city’s cute medieval old town, there was plenty to entertain ourselves with. A couple of nights of our stay we were guests at two of the four Radisson Blu Hotels you can find in Riga, the Radisson Blu Elizabete Hotel and the Radisson Blu Hotel Latvija, both very conveniently located in between the old town and the Art Nouveau district. 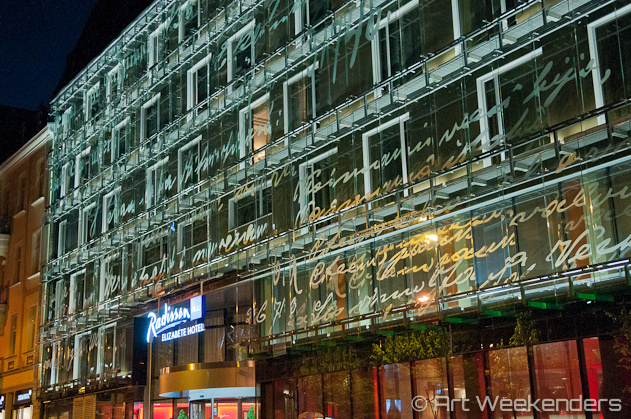 The Radisson Blu Elizabete Hotel’s glass facade is engraved with the text from five dainas, the Latvian traditional folksong, welcoming and saying farewell to guests. Especially at night when the building is lit, these texts create a special effect, which immediately gives away a bit of the the stylish interior of the hotel itself. In this Radisson Blu hotel design plays an important role, which you’ll immediately see when arriving in the lobby, the restaurant, the funky C.U.T. bar downstairs and of course the rooms themselves. We stayed in a spacious, stylish room on the 8th and highest floor, where careful attention was paid to the details, making our stay very comfortable. When you have a room to the front-side of the building you’ll look out over the green Vermanes park at the other side of the road, making a stay here an idyllic one while in the very heart of he city. Apart from the space the added touch for us was definitely the spacious modern bathroom, including a bathtub, separated from the main room with a modern sliding door and a spacious wardrobe. Because, what’s better than taking a bath after a long day of wandering through the city? in case of nice weather you can relax in the stylish inner courtyard, where you can also have dinner if you prefer sitting outside instead of the inside. The breakfast of the hotel’s restaurant is extensive, includes a great mix of all different kind of tasty local and international dishes, so you can start the day filled up with energy. For those wanting to keep up with their fitness routines, the hotel also has a comfortable fitness centre next to a relaxing sauna. 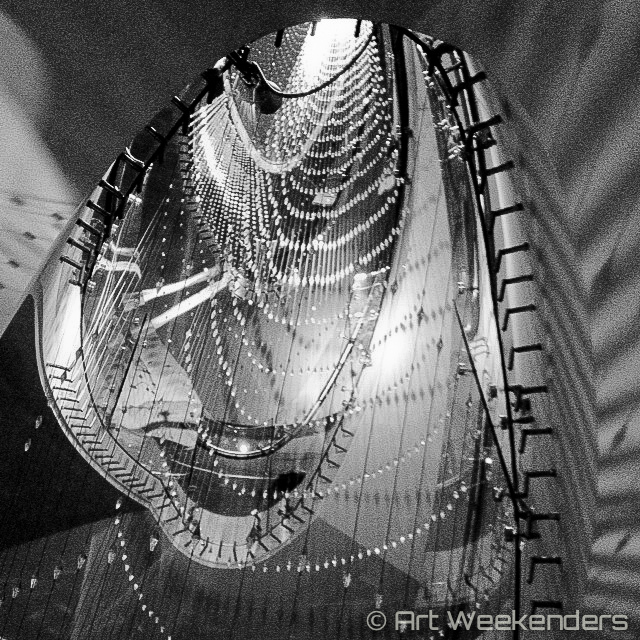 Lounge area in the Radisson Blu Elizabete Hotel in Riga, Latvia. Location-wise the hotel is situated at a perfect spot in between the city’s old town and the Art Nouveau district, two areas you’ll not want to miss during your stay in Riga. 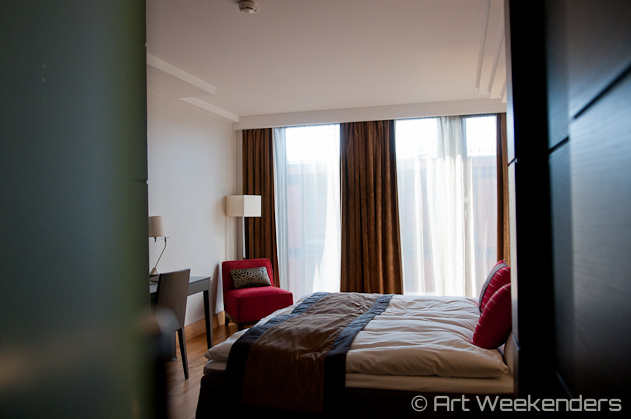 Would you like to stay in a stylish, comfortable design hotel in Riga than this is a fantastic option. After spending a night outside the city in the Mark Rothko Center in Daugavpils we stayed our last night in Riga at the Radisson Blu Hotel Latvija. Being 26 floors high it’s one of the landmarks at this side of the city – also in between the Art Nouveau district and the old town, just blocks from its sister hotel Elizabete – and the largest and most-reputable business and conference hotel in town. 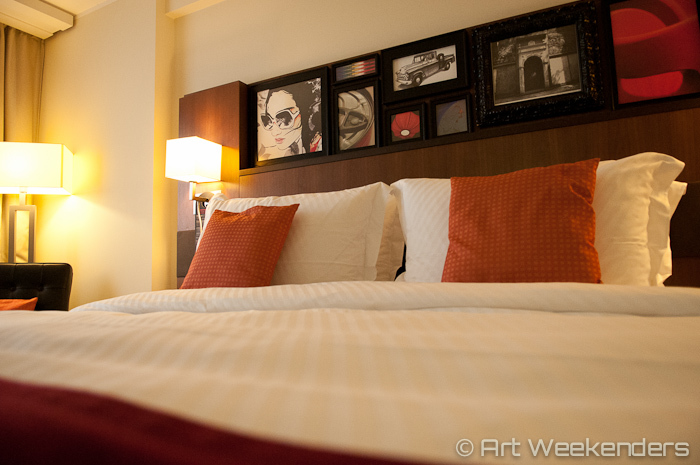 This time we were surprised by a comfortable and stylish room at the 17th floor with a magnificent view over the city. With the handy map provided by the hotel we could exactly locate the other landmarks in the cityscape. 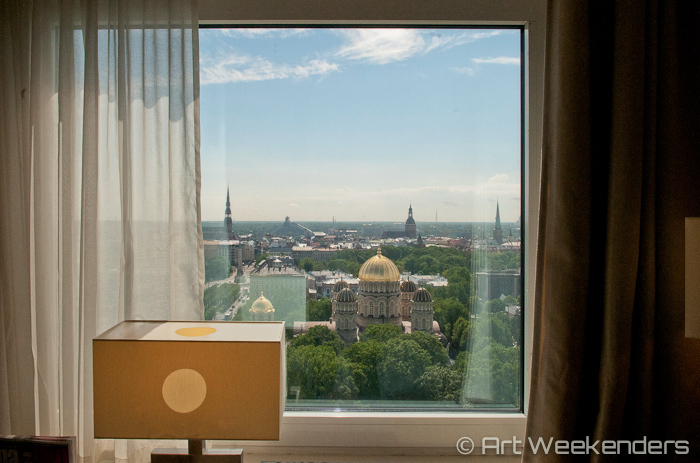 From the Skyline Bar at the 26th floor you’ll have an even better – panoramic – view over Riga. It’s a perfect place to watch the sun set down while having a drink or two, also if you happen to stay somewhere else in town. Again we enjoyed a spacious bathroom with modern facilities. This time a bath was not necessary as we were invited to enjoy a swim at the excellent and award-winning ESPA Riga spa which offers different pools, saunas, fitness facilities and spa treatments. The joy is not over when you’re done with the spa itself, the changing rooms are also fully equipped, clean, modern and comfortable, equipped with everything you need after your spa time. Even if you’re not staying at the hotel you’re welcome to visit – we can picture how nice it is coming in here on a winter day after a stroll through the city to relax in the comfort of the spa. In the Espa Riga Spa of the Radisson Blu Hotel Latvija – Riga, Latvia. 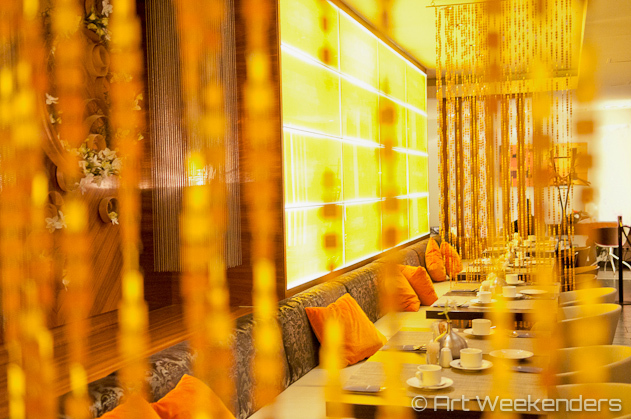 The hotel has different trendy bars, a nightclub and restaurants where dinner and lunch are being served. The breakfast here is as excellent as at the Radisson Blu Elizabete Hotel, food is simply tasty everywhere we’ve been in Latvia and the hotels are no exception to that. There’s an on-spot chef as well to prepare for instance your eggs as per your preference. Would you like to stay in Riga somewhere central, comfortable and equipped with exquisite facilities like dining, going out, a stunning city view and a spa closeby? This is definitely a hotel that won’t let you down. 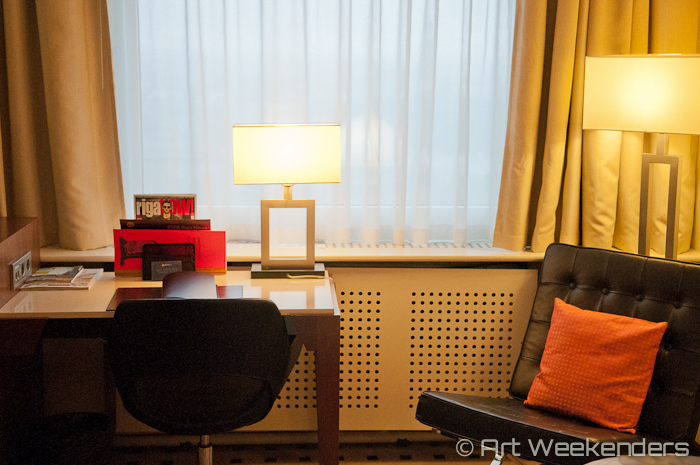 Both two hotels of Radisson Blu in Riga we stayed at are a very good price-quality value. Whichever hotel you choose, you will have a pleasant, comfortable and satisfying stay. Depending on the type of visit you have in mind and your personal preferences, we’d propose Radisson Blu Elizabete Hotel for the visitors who have a more intimate design-influenced feel in mind, and Radisson Blu Hotel Latvija for the ones preferring the feel of a big hotel with a buzzing atmosphere. And wherever you stay, make sure you take your chance to relax at the Espa Riga Spa, it will do you good winding down after a long trip or an intense walk through the city. And a drink at the Skyline Bar is a must too: you won’t have a better view from anywhere in town. 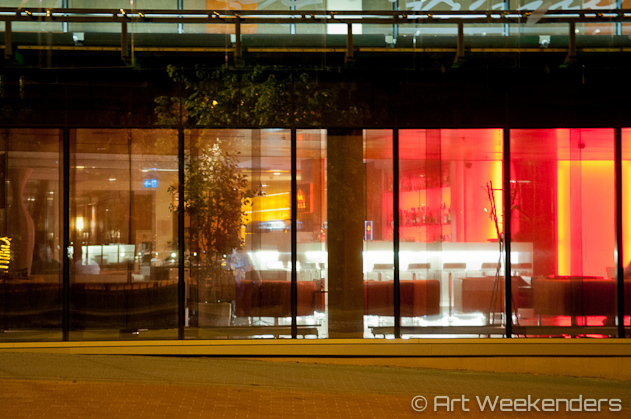 Disclaimer: we were kindly hosted by Radisson Blu Riga. The opinions above are however fully our own.